The global market for inflation-indexed securities has ballooned in recent years, and this trend is set to continue. This book examines the rationale behind issuance and investment decisions, and details the issues facing anyone who designs indexed securities, illustrating them wherever possible with actual examples from the international capital markets. In particular, an extensive review of indexed debt markets throughout the world is provided - including for the first time, a comprehensive and consistent set of cash flow and price-yield equations for the instruments already in existence in the major bond markets - forming an important reference for those already experienced in the field, as well as practitioners and academics approaching the subject for the first time. The book also provides unique insight into the development of inflation-indexed derivative products, and the analytical tools required to value such instruments. MARK DEACON has worked as a quantitative analyst at the UK Debt Management Office (DMO) in London since April 1998, having formerly worked at the Bank of England. He is also Deputy Head of the DMO's External Liaison Unit, as well as having overall responsibility for the DMO web site. The research carried out by Andrew Derry and Mark on the use of indexed and nominal bond prices to derive estimates of inflation expectations formed the basis of the 1994 book Estimating and Interpreting the Yield Curve (which they co-authored with three others). 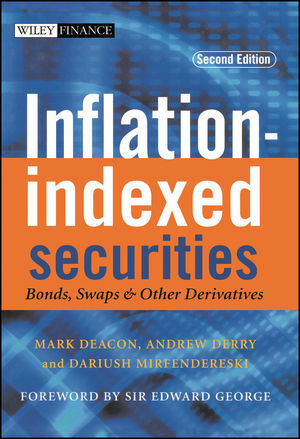 Mark and Andrew worked together again on the first edition of Inflation-Indexed Securities, which was published in 1998. Mark has written chapters in the Handbook of Inflation Indexed Bonds and in Investment Banking: Theory and Practice. Mark has an MSc and a BSc in Mathematics from Warwick University and has also studied at the London School of Economics. In 1998 he was awarded Chartered Mathematician status and in 2001 joined the Editorial Board of the Journal of Bond Trading & Management. ANDREW DERRY works for JWM Pa rtners, a fixed-income relative value hedge fund manager. He is based in London and is part of the team responsible for the funds' European fixed-income investments, with particular responsibility for managing positions in the UK and other non-EMU countries, a role he has performed since the company's formation in 1999. Prior to joining JWM Partners, from 1994 to 1999 Andrew worked for LTCM in London and Tokyo. Previously, from 1991 to 1994 he worked as an analyst in the Quantitative Financial Economics Group at the Bank of England. Andrew has a BSc in Economics with Computing and Statistics from the University of Bath, and an MSc in Applied Statistics and Operational Research from Birkbeck College, University of London. DARIUSH MIRFENDERESKI is the senior inflation derivatives trader at Barclays Capital. Based in London, he has been responsible for trading all UK and European inflation swaps and options since 1998. Additionally, he has been closely involved with the Barclays derivatives sales force in promoting client interest and familiarity with inflation-linked derivatives, covering corporate, financial institution, and hedge fund client bases. Dariush has also been leading Barclays' efforts in developing the new market for US CPI swaps in 2003. Prior to joining Barclays, Dariush worked from 1993-1996 in San Francisco at EQECAT, a risk consultancy specializing in catastrophe risk assessment for insurance and reinsurance companies, where he was responsible for the modelling of the risk-simulation and insurance pricing models. Dariush obtained his BSc and MSc degrees from UCL and Imperial College London and subsequently a PhD in engineering at the University of California at Berkeley. Foreword by Sir Edward George. 1 What Are Inflation-indexed Securities and Derivatives? 1.2 How indexed bonds work. 1.3 The role of derivatives. 2.1 Choice of price index. 2.1.2 Index reliability and integrity. 2.2.1 Capital Indexed Bond (CIB). 2.2.2 Interest Indexed Bond (IIB). 2.2.3 Current Pay Bond (CPB). 2.2.4 Indexed Annuity Bond (IAB). 2.2.5 Indexed Zero-Coupon Bond (IZCB). 2.2.6 Other types of indexed bonds. 2.2.7 Cash flows of the different structures. 2.2.8 Factors that influence the choice of security design. 2.3 Application of the index to the cash flows. 2.3.1 The problem of the indexation lag. 2.3.2 Why indexation lags are necessary. 2.3.3 How to minimise the indexation lag. 2.3.4 Full or partial indexation? 2.4 The impact of tax regulations. 2.4.1 Uncertainty of post-tax real yields. 2.4.2 The effect of income accrual rules. 2.5 Options on indexed bonds. 2.6.2 Cost-effectiveness and market development. 2.6.3 Consistency with other instruments. 2.6.4 What happens in practice? A2.1 Calculating the base annuity payment for Indexed Annuity Bonds (IABs). A2.2 Barro’s proposal for revising the inflation adjustment of payments on index-linked gilts. 3 Why Invest in Indexed Debt? 3.2 Relative stability of returns. 3.3 Performance relative to conventional bonds and equities. 3.5 Duration and other cash flow considerations. 3.8 Other potential deterrents to investing in indexed bonds. 3.9 Alternatives to indexed bonds. 4 Why Issue Indexed Bonds? 4.1 Why governments issue indexed bonds. 4.1.1 Reducing borrowing costs: the role of inflation expectations. 4.1.2 Reducing borrowing costs: saving the inflation risk premium. 4.1.4 Inflation-indexed bonds and monetary policy. 4.1.5 Maintaining long-term capital markets in difficult economic conditions. 4.2 Why private corporations issue indexed bonds. 4.3 The relative scarcity of index-linked bonds. 5 Inflation and Real Interest Rate Analysis. 5.1 Measures of real interest rates. 5.1.1 Real gross redemption yields. 5.1.2 Hedge ratios: the duration and "beta" of inflation-indexed bonds. 5.1.3 The term structure of real interest rates. 5.2 Measures of inflation expectations. 5.2.2 The "inflation term structure". 5.2.3 The inflation risk premium and bond convexity. 5.3 Analysis of real interest rates and inflation expectations. 5.3.2 Measures of inflation expectations. 6 Major International Indexed Bond Markets. 6.1.1 A brief history of indexation in Australia. 6.1.2 The structure of the Commonwealth Treasury Indexed Bond (TIB) market. 6.3.1 The history of indexation in France. 6.3.2 The introduction of inflation-indexed OATs (Obligations assimilables du Trésor). 6.3.3 Indexation to pan-European inflation – OATc€ i bonds. 6.4.1 The formation of the Swedish government index-linked bond market. 6.4.2 The development of the market toward international standards. 6.5.1 A brief history of the index-linked gilt market. 6.5.2 The structure of the index-linked gilt market. 6.5.3 The market for non-government index-linked bonds in the UK. 6.6 United States of America. 6.6.1 A brief history of indexation in the USA. 6.6.2 The launch of the Treasury Inflation-Indexed Securities (TIIS) market. 6.6.3 The expansion of the TIIS programme in the fiscal surplus years. 6.6.4 Recent developments in the market for inflation-indexed securities in the USA. A6.1 Cash flow calculations for Australian Capital Indexed Bonds (CIBs). A6.1.1 Calculation of interest payments. A6.1.2 Calculation of the settlement price. A6.2 Cash flow calculations for Canadian Real Return Bonds (RRBs). A6.2.2 Calculation of interest payments. A6.2.3 Calculation of the redemption payment. A6.2.4 Calculation of the settlement price. A6.3 Cash flow calculations for French OATi and OATc€ i bonds. A6.3.2 Calculation of interest payments. A6.3.3 Calculation of the redemption payment. A6.3.4 Calculation of the settlement price. A6.4 Cash flow calculations for Swedish index-linked Treasury bonds. A6.4.2 Calculation of interest payments (for coupon-bearing bonds). A6.4.3 Calculation of the redemption payment. A6.4.4 Calculation of the settlement price. A6.5 Cash flow calculations for UK Index-linked Gilts (IGs). A6.5.2 Calculation of interest payments. A6.5.3 Calculation of the redemption payment. A6.5.4 Calculation of accrued interest. A6.5.5 Calculation of real yields. A6.6 Cash flow calculations for US Treasury Inflation-Indexed Securities (TIIS). A6.6.2 Calculation of interest payments. A6.6.3 Calculation of the redemption payment. A6.6.4 Calculation of the settlement price. 7 Other Indexed Bond Markets. 7.4.1 1964–1986 Readjustable National Treasury Obligations (ORTNs). 7.4.2 1986–today National Treasury Obligations (OTNs), Treasury Bonds (BTNs) and National Treasury Notes (NTNs). A7.1 Calculation of the settlement price for Colombian TES-UVR bonds. A7.1.1 Calculation of the settlement price. A7.2 Calculation of the settlement price for Icelandic Treasury Bonds. A7.2.2 Calculation of the settlement price. A7.3 Calculation of real yields for Israeli inflation-indexed bonds. A7.3.1 Sagi and Galil bonds. A7.4 Cash flow calculations for New Zealand Treasury inflation-indexed bonds. A7.4.1 Calculation of interest payments. A7.4.2 Calculation of the settlement price. 8 Inflation-linked Derivatives: Market Description. 8.1.2 Why Inflation-linked (IL) derivatives? 8.1.3 The Inflation-linked (IL) derivatives markets in 2003. 8.2 A brief history of Inflation-linked derivatives markets. 8.2.3 The French and Euro-zone markets. 8.3.1 Standard derivative solutions for Inflation-linked (IL) issuers. 8.3.2 Private Finance Initiative (PFI) projects in the UK. 8.3.4 Swap structures to mitigate credit exposure. 8.4.1 The use of inflation swaps to hedge pension liabilities. 8.4.2 Inflation-guaranteed and Inflation-linked (IL) retail products. 8.5.1 Options embedded in bonds. 8.5.2 Standalone inflation options in the Over The Counter (OTC) market. 8.6.2 Pension reforms in Europe. 8.6.3 The implications of changes to accounting standards. 8.6.4 Further development of the inflation derivatives markets. A8.1 Example swap and option structures. A8.1.1 Capital Indexed Bond (CIB)-style swaps. A8.1.3 Interest Indexed Bond (IIB)-style swaps. A8.1.4 Standard inter-dealer broker market structures. 9 Inflation-linked Derivatives: Pricing, Hedging and Other Technical Aspects. 9.2.1 What is meant by ‘‘pricing’’? 9.2.2 Four levels of pricing. 9.3 Deriving a forward Consumer Price Index (CPI) curve for Level II and III markets. 9.3.1 Piecewise linear continuous function in CPI space. 9.3.2 Piecewise linear continuous function in inflation space. 9.4 ‘‘Level I’’ markets in Europe: intraregional Euro-zone inflation spreads. 9.5 Alternative approaches to the construction of inflation curves. 9.6 Asset swaps – connecting swap and bond prices. 9.7 Hedging a swapped new issue. 9.7.1 A simple ‘‘interim’’ hedge. 9.7.2 A more precise hedge. 9.7.3 A portfolio hedge for net outright inflation risk. 9.8 The evolution of the Euro-zone HICPswap market. 9.8.1 Seven lessons from seven months of Euro-zone inflation swap data. 9.9 Historical estimation of price index volatilities. 9.10.1 Zero percent zero-coupon floors.